This new, innovative cooler is perfect for any non-medical application that requires passive cooling (no water, no freon). 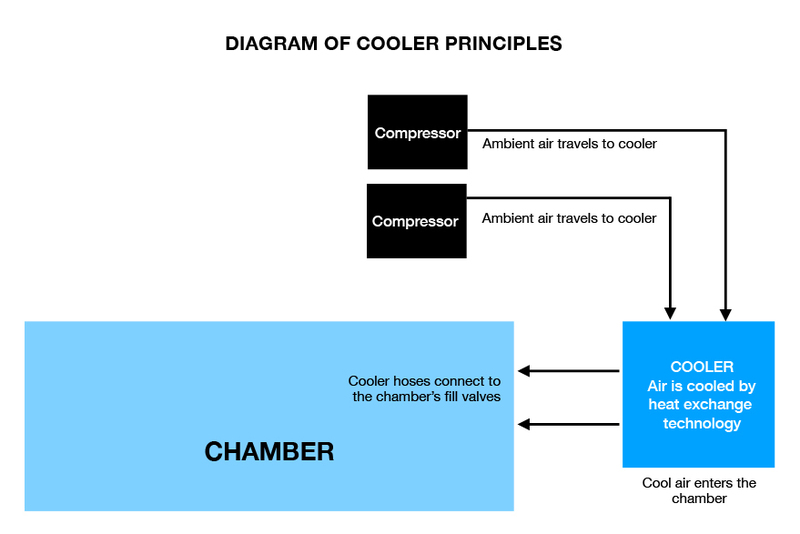 This new cooler, US Patent #9,664,202 B2, uses hyperbaric principles to cool the air. Air depressurizing into the area being conditioned cools the air. This cooler, designed by Cool Hyperbarics, is unique to the hyperbaric cooling industry. It utilizes a heat exchange technology. Its efficiency is based on the zero-pressure differential principle which prevents the reheating of the cooled air as it enters the chamber. 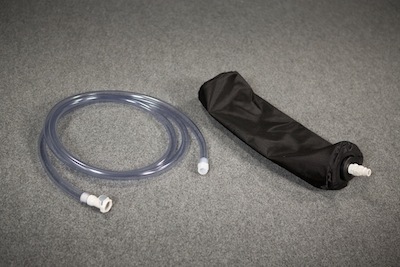 More specifically, the present invention accomplishes this by arranging an air compressing unit, an air cooling unit, and an air discharging hose so that a flow of output warm air from the hyperbaric chamber can be recycled and converted into a flow of input cold air. This technology while simple achieves better results than coolers costing 2, 3, 4 times as much. Depending on your environment you can cool your chamber with our cooler using cold tap water or for maximum cooling adding ice. 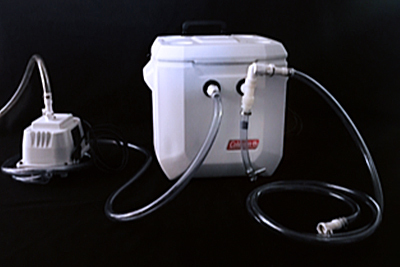 The cooler has been successfully tested with only one line of chambers compatible for the required configuration to support this zero pressure feature. Therefore, it is sold only for use with the Summit to Sea line of chambers as it has been successfully tested with these chambers. This cooler is not marketed for use with any other medical devices.